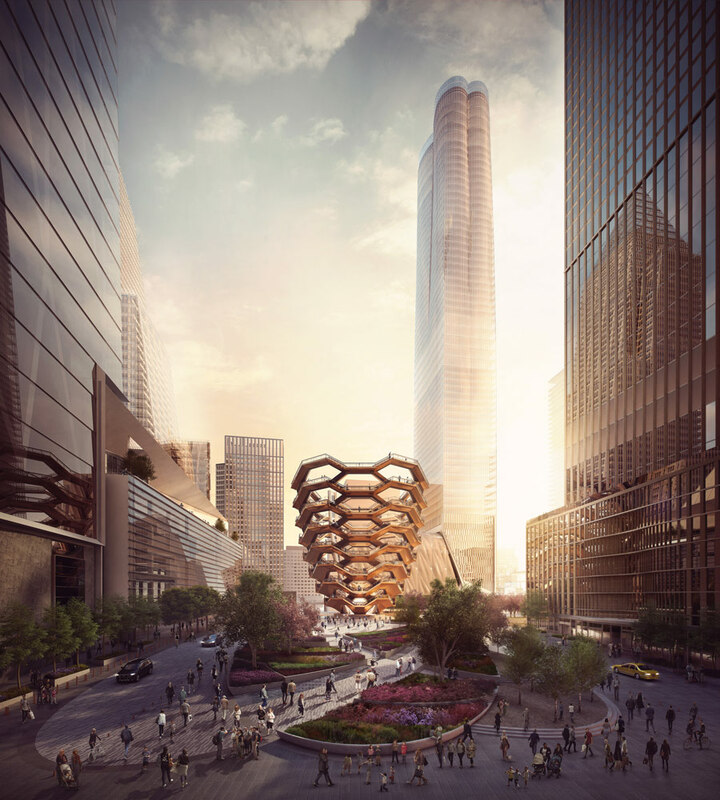 Stephen M. Ross, president of Related Companies, Thomas Woltz, founding principal of Nelson Byrd Woltz Landscape Architects (NBW), and Thomas Heatherwick of Heatherwick Studios spoke with Cooper about the value of public space in New York and the opportunities that designing a park and plaza ab ova present. The project’s cost was previously reported as $200 million, though there’s been no update on whether that’s changed with the just-unveiled design. In a see-and-be-seen city where even the ultra-rich schlep in and out of the subway, Vessel elevates the time-honored art of flânerie to civic priority. 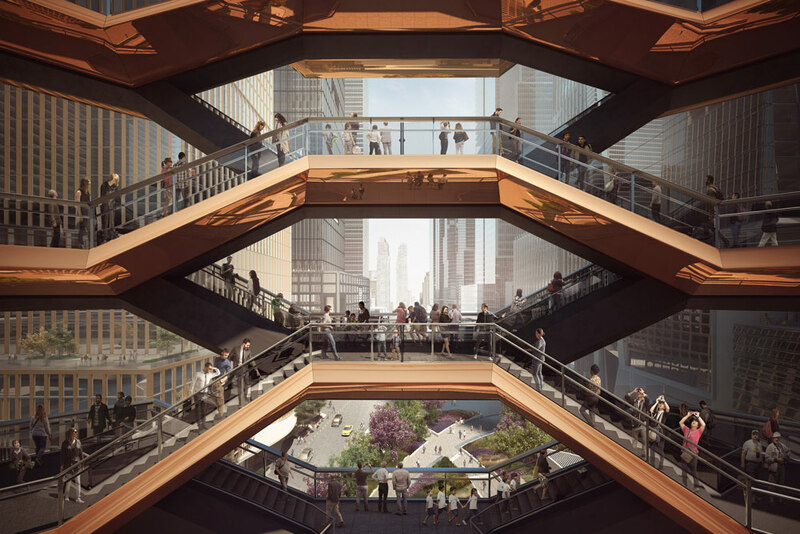 Its 154 vertiginous steel-and-concrete staircases are meant to help visitors experience Hudson Yards and surrounding people from as many angles as desired (or, perhaps, angles unintended). The stairs and viewing platforms converge in a lattice that suggests a panopticon with the geometry of an inverted beehive. 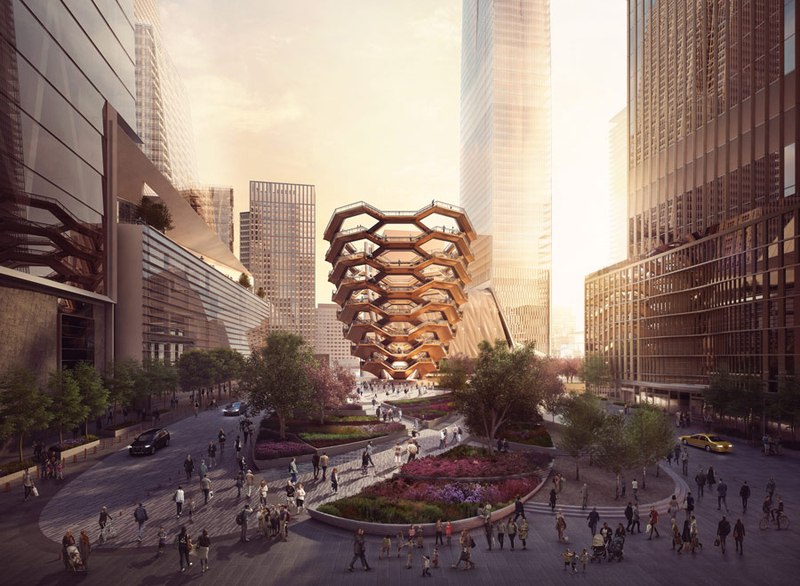 When complete, the 16-story structure will be the tallest freestanding observation platform in the city (at least until the New York Wheel starts rolling). The design blends a key cue from the High Line—elevation—and reacts to the city’s fire escapes, stoops, and the countless staircases that facilitate the flow of people in the city. 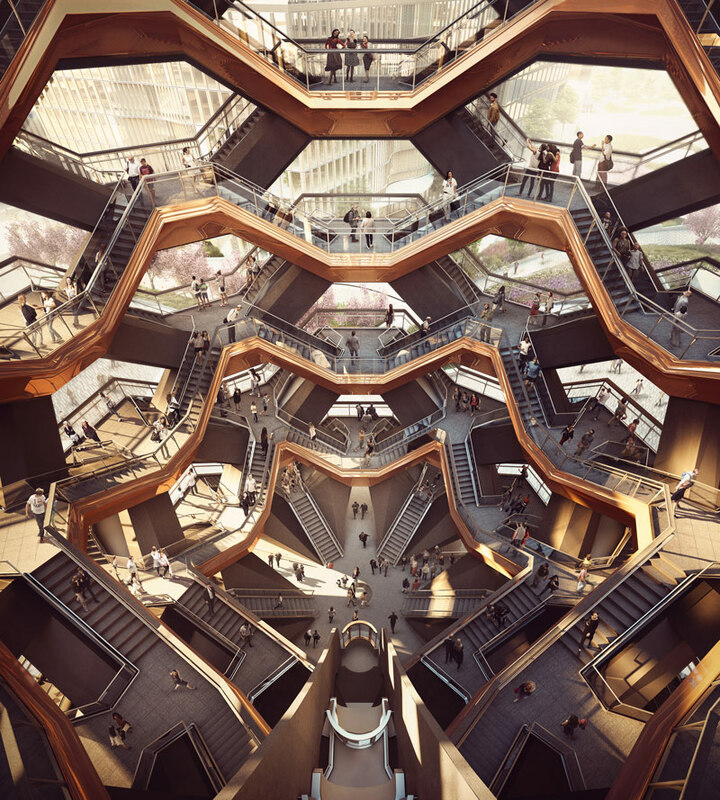 “We wanted to make a project out of just stairs, an ultimate body thing,” Heatherwick explained. Visitors can hit their FitBit goals twice over by climbing 250 flights to the structure’s top. 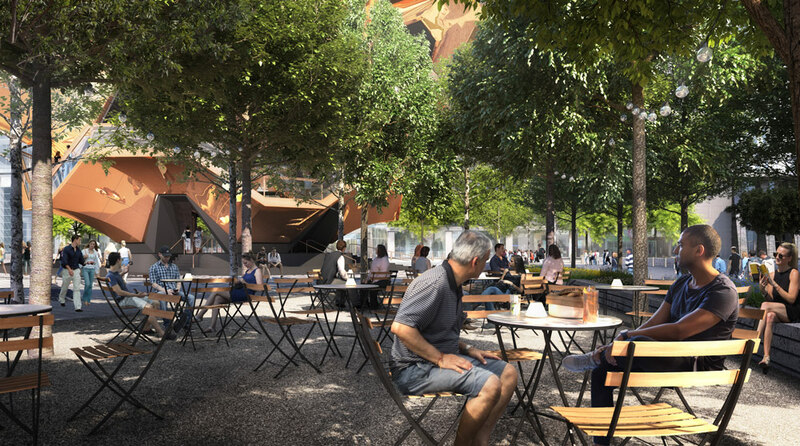 On the ground, NBW collaborated with Heatherwick to create the Public Square and Gardens at Hudson Yards, a six-acre public space that links Hudson Yards with Hudson River Park and the High Line, which will get a new on-site entrance at Tenth Avenue and 30th Street. 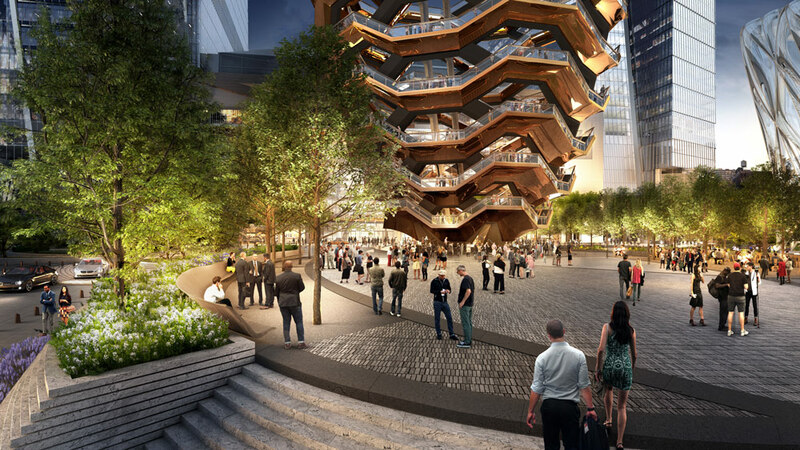 Like Heatherwick, who designed Vessel’s teacup form with upper-story office workers in mind, Woltz wanted “to create a site that was quite graphic” for the square and gardens. The firm consulted 400-year-old maps to determine the site’s original environmental conditions (it was a wet meadow) and captured a snapshot of native flora from that time, Woltz told AN. This is one of NBW’s two active commissions for landscapes over infrastructure: The platform the park sits on is the ventilation cover for the rail yard below, and the platform had to be engineered to support 200 mature trees. “The landscape operates in a seven-foot-thick sandwich of structure. I will never in my life take for granted being on real earth, because everything here is constructed,” Woltz said. Amid exhalations on Twitter, some raised concerns about the accessibility of the public spaces, especially Vessel, whose stair-fixation seemed to exclude parents with strollers and people who use wheelchairs. A model depicted elevators on a fixed track—hardly the expansive views and exuberant movement promised by the architects. The project is inclusive, Heatherwick maintained. 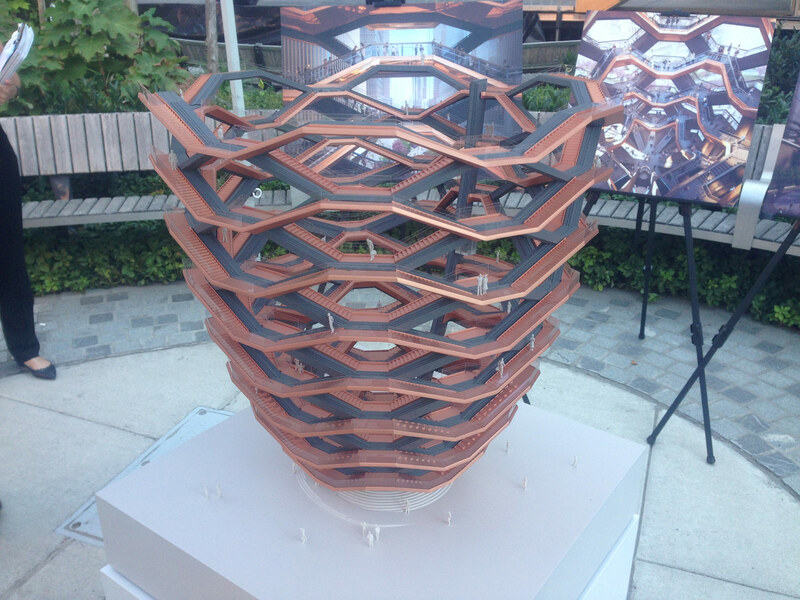 He told AN that the model is outdated; new renderings, including the bird’s eye view, below, were captured from elevators that snake around Vessel‘s insides on curving tracks. Vessel will be complete in 2018.